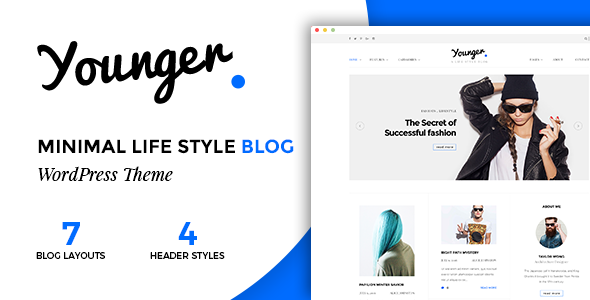 Young Blogger is a Clean Simple and Blogging Theme for personal bloggers. Keep every single detail is simple and efficient for your readers and your important content catches eyes of site visitors. Features Included Visual Composer page builder Premium slider Revolution 7 Blog Layouts 3 Header Layout One Click data import Based on 1170px grid system Responsive layouts Instragram feed Live Customize options Creative u0026amp; dedicated design Image Credits – 123rf.com : No images are distributing with this template. Used it for only presentation purpose. Compatible with WPML, Visual Composer 5.1.x, Visual Composer 4.12.x, Visual Composer 4.11.2.1, Visual Composer 4.11.x, Visual Composer 4.10.x, Visual Composer 4.9.x, Bootstrap 3.x. Younger Blogger has been tested with browsers IE11, Firefox, Safari, Opera, Chrome, Edge.